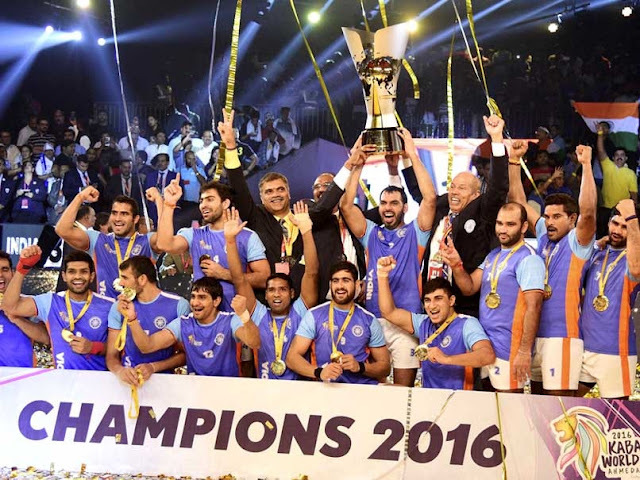 India defeated Iran by a margin of 38-29 in the final to win their third Kabaddi World Cup. India staged a heroic comeback in the second half to beat Iran and lift the World Cup for third time in a row in 2016 Kabaddi World Cup final held at 22.10.2016 in Ahmedabad, India. The 2016 Kabaddi World Cup, the third standard-style Kabaddi World Cup, was an international kabaddi tournament governed by the International Kabaddi Federation, contested from 7 to 22 October 2016 in Ahmedabad, India. Twelve countries had competed in the tournament. The tournament is being hosted at The Arena (currently known as The Arena by TransStadia, pending the sale of official naming rights), a newly-constructed convertible stadium in Ahmedabad. In its standard configuration, it operates as an outdoor football pitch capable of seating 20,000.